Building models to describe the dynamics of macroscopic currents through ion channels has been the object of numerous studies in the literature with the aim of understanding ion-channel function. Following a perturbation, typically a step in voltage or ligand concentration, the response is formed by a combination of different processes such as activation or inactivation that pull the measured quantity (macroscopic current) in the same or opposite directions with different strengths and different time constants. Although this dynamic response can be readily recorded in time, the relationship between the underlying processes cannot be easily teased apart without structural analysis or single-channel recordings. An example is the classic problem of determining from sodium-channel macroscopic traces whether the activation and inactivation processes occur in parallel or inactivation is dependent on previous activation. We present a mathematical tool to analyze electrophysiological traces and derive molecular kinetic schemes that reflect the interplay between the different processes involved. This tool is based on system-identification algorithms and consists of three modules as summarized in Figure 1. The identifier takes the input and output signals in the time domain and applies autoregressive ARX methods to obtain a transfer function in the Laplace domain yielding a set of poles, zeros and gain that provide a unique signature of the channel response. The classifier capitalizes on this signature to reveal the block diagram associated with the interplay of the processes, that are here described as first order systems in classic engineering terms (a relaxation with one time constant and a gain for each process). 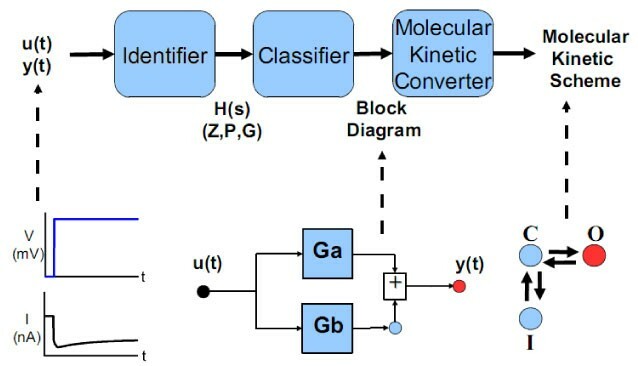 Finally, the molecular kinetic converter uses the transfer function together with the block diagram and maps them into a molecular kinetic scheme, a description with states associated with a system of differential equations. A diagram of the analytical methodology applied to voltage-clamp experiments. u(t) and y(t) are the input and output time signals respectively, H(s) denotes the transfer function in the Laplace domain; Z,P,G the zeros, poles and gain associated to it and Ga, Gb represent first-order systems. We show that we can apply this methodology to voltage-activated L-type calcium-channel traces from voltage-clamp experiments and derive a molecular kinetic scheme. Furthermore, we show how these molecular kinetic schemes can reveal the mechanism of action of drugs that act on calcium-channels. Our results explain the utility of this methodology for obtaining information on molecular mechanisms from electrophysiological traces. Moreover, they illustrate how the analysis could be generalized to recordings from other biological experiments.